If you own or are about to order a portable kitchen tool set, this will make the perfect addition.When it comes to getting outdoors, Our picnic wallet gets you out the door sooner - slip it in your bag, cooler or tote and know you're prepared for any outdoor dining occasion. The picnic wallet includes Forks, Spoons, Serrated Knives, Butter Knife, Cutting Board, Dinner Plates. 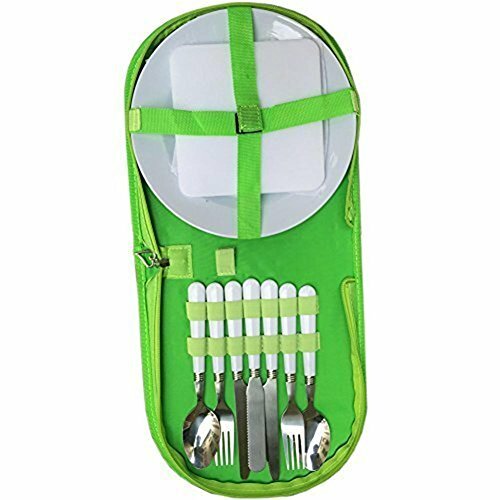 COMPACT-ABILITY: Neatly organizes and holds your utensils in one convenient place. Will not get smeared, scratched or damaged in storage or in transit. Provides easy access to your cooking utensils and it is equipped with a secure zip seal. TRAVEL FRIENDLY: Perfect for family outings to the Beach, Park or picnic, hiking and camping. Great for keeping in the car, or for storing in suitcases and backpacks.